Take one brand-new Mac mini Intel Core Duo. Turn it on for the very first time. If it is connected to the Internet, it will, after a minute or two, prompt you to install some updates. 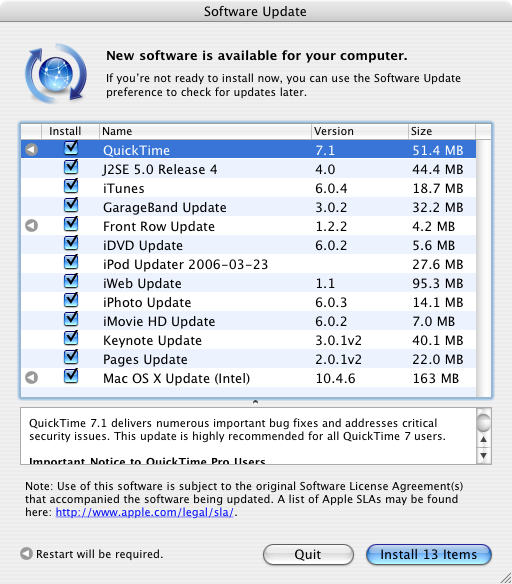 In this illustration, the brand-new Mac mini – a tiny computer – is asking to install over half a gigabyte of updates: 525.6 megabytes of operating system patches, application patches, technology patches and whatnot. That may seem like a staggering amount of information to be “patched,” but a Mac mini, despite the petite size, can do a staggering number of things. So don’t hesitate: install the patches. Patches come in all shapes and sizes. Some of these patches are to bring the Intel-based Macs more in line with the capabilities of the PowerPC-based Macs. Some of these patches add new features or tweak the features of Apple applications, such as the patches to iTunes, GarageBand, iDVD, iWeb, iPhoto, iMovie, Keynote and Pages. Some of them are updates to hardware-specific features, such as the Front Row update (only of use to Macs with a remote control). Some of the updates may be for peripherals you don’t even own (yet), such as the iPod update. Regardless of circumstances, install the updates. You might quibble over a few -- if you never intend to use iWork, and intend to throw away the iWork demos that ship with new machines, you can skip the updates to iWeb, Keynote and Pages -- but for the most part, install everything. An astonishing number of Mac users pick and choose which updates to install using completely arbitrary “standards,” and then wonder why they seem to have problems nobody else does. Give yourself a fighting chance: install the updates. For those who lack a high-speed Internet connection, downloading 525.6 megabytes of patches will consume a very, very long time. If you live near the Pi office, consider stopping by the Tuesday Night Clinic (operating most Tuesdays, but not, for example, Tuesday, July 4, 2006) and, in return for using the Pi’s high-speed connection, offer a donation to pay the utility bills. But don’t skip updates because you don’t have a high-speed Internet connection, or don’t want to take the time, or don’t want to be bothered. You’ll be far more bothered and waste far more time if your Mac gets sick.